New to Hot Yoga- or just new to our studio? Maybe you haven't taken a yoga class in a while, or are unsure if our studio is a good fit for you? Experience BASK firsthand and see the amazing physical & mental benefits that our classes deliver. Bask was created to be a place that welcomes everyone to practice yoga regardless of their age or fitness level, cultivating a diverse group of individuals. I want to come to BASK, what do I do? We can't wait to meet you! You can either make an account online here or simply come to the studio 15 minutes early before any scheduled class and an instructor can help create an account for you and get you setup for payment your purchase. Yes- Yoga is for everybody! Don't let a lack or flexibility or strength turn you off to yoga! Everyone starts somewhere, and in every single BASK yoga class, we encourage you to do whatever it is you need to do to feel comfortable. Let an instructor know you are new to yoga, and we will be happy to show you a few basics and how to modify any pose to make it work for your body. Can I take breaks in class? Yes, at any time feel free to take a break, omit any poses, or sit in child's pose or lay flat on your mat if necessary. This is your practice and your time, do what you need to do to honor your body. Sip water and towel off at any point during class. 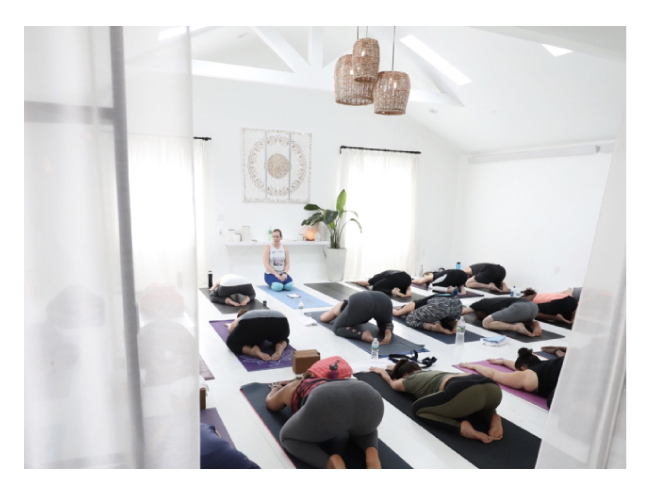 Every class is structured to include multiple components including: time for meditation & pranayama (breath work), a physical warm up, standing poses, balancing poses, strength building, twists, back bending, and inversions. We conclude each session with Savasana, an integral part of a yoga practice- a final resting posture where all of the physical benefits of our yoga practice can settle in to the body. Please respect the silence, stillness and peace of those around you- and remain quiet and still, if you need to leave class early please do so prior to savasana. We suggest wearing form fitting clothing similar to what you would wear at a gym, bringing a bottle of water, hand towel and a yoga mat. You can also just bring yourself as we have everything for you at the studio! Don't have yoga mat? No problem, use one of our natural rubber studio mats as a free rental! Just leave a personal item at the front desk in exchange. After use, please thoroughly clean it with the provided mat cleaner and hang it up to dry on the mat rack. Hand towels are available for rent for $1. (Unlimited members get free use of towels) Refrain from wearing perfumes or strongly fragranced lotions.